In the past forty years there has been a revolution in logic. There is a widening consensus that mathematical logic has not been a satisfactory theory of argumentation, where argumentation is taken as a means of rational belief-revision and conflict resolution. It is also widely held that the traditional informal fallacies are inadequately analyzed in standard accounts found in the logical writings of the period 1950-1970. Here in nineteen chapters are the classical papers of Woods and Walton published in the decade 1972-1982, and constituting the so-called Woods-Walton Approach to fallacy theory. Originally published as a collection in 1989, the book is now re-issued with a new Forward by Dale Jacquette. Woods and Walton are recognized for their seminal role in reviving the fallacies project in logic and giving to the fallacies research programme much of its evolving character and emphasis. It is one of their principal contentions that the fallacies respond best to theoretical pluralism and that different analytical tools are needed for different fallacies. Again conveniently available in a single volume, these papers are indispensable reading for a new generation of researchers in informal logic, argumentation theory, critical thinking, computer science, linguistics and cognitive psychology. 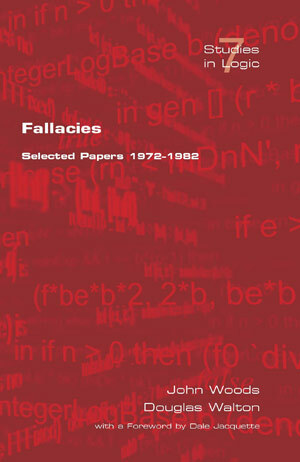 John Woods is also author of The Death of Argument: Fallacies in Agent-Based Reasoning 2005. Douglas Walton is author of A Pragmatic Theory of Fallacy 1995.